It will support your "Excuse me" situations! 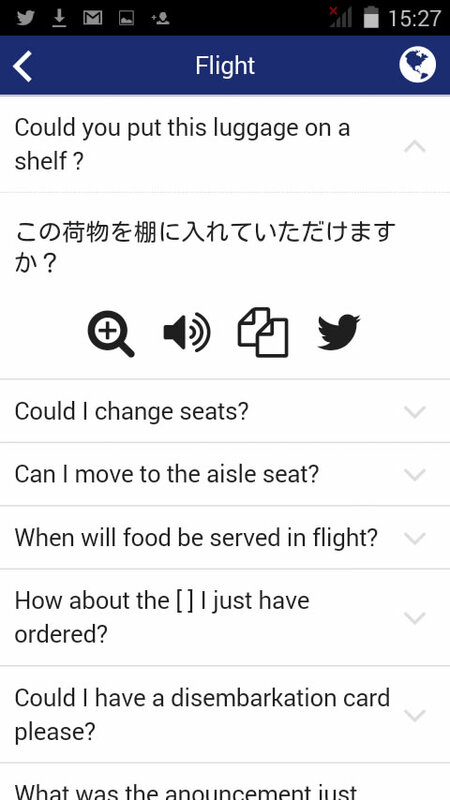 Collection of phrases for overseas travel that is easy to use offline, for free. 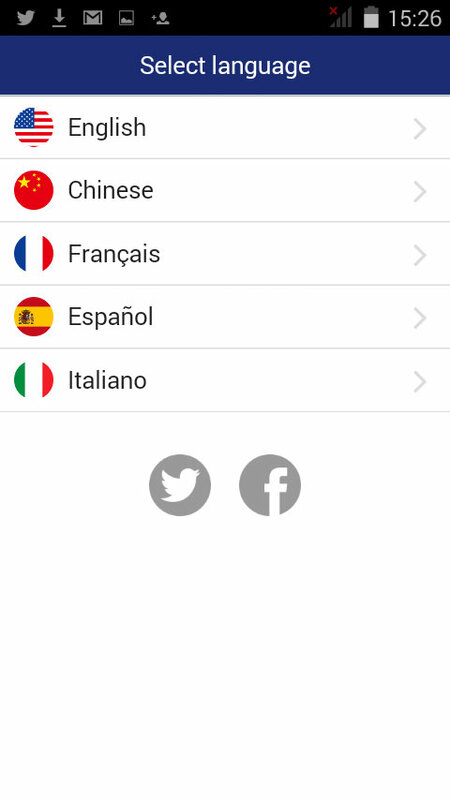 Download the app for the language you want! 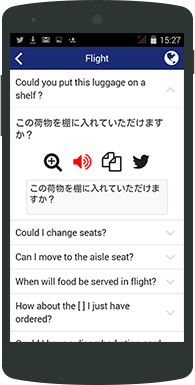 You can find each language phrases in different situations in other languages (English, French, Spanish,Italian,Chinese, and Japanese) with this app while you are traveling in their language -speaking countries. 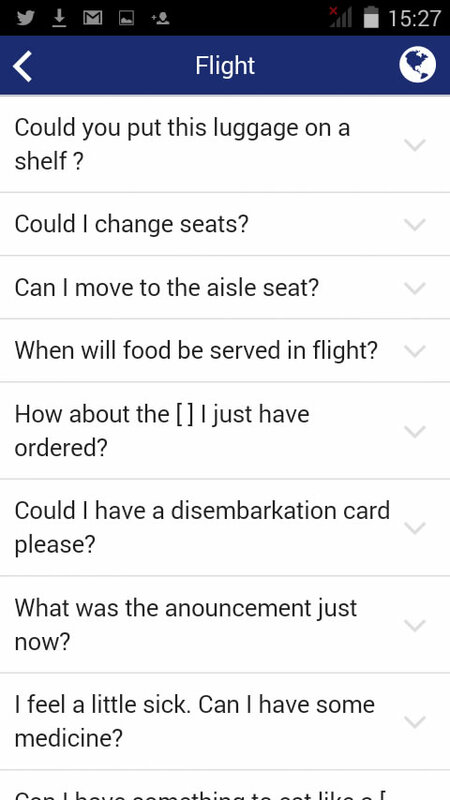 This app includes about 200 following questions after "Excuse me" and practical phrases. 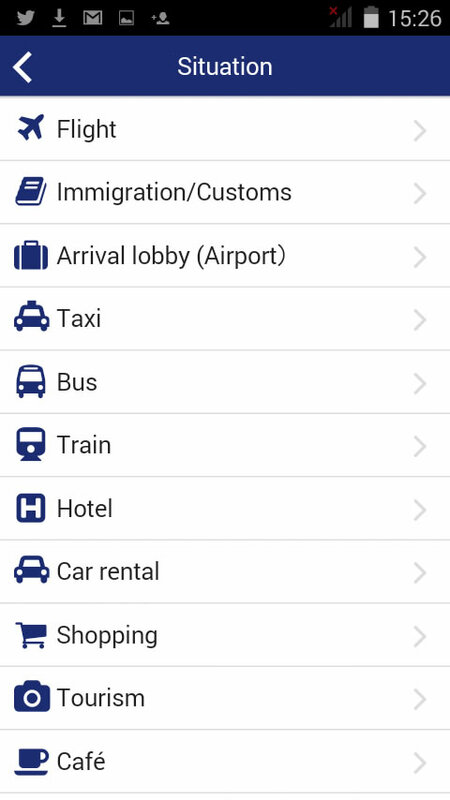 This app will be useful to deal with the language barrier during your vacation or business trip overseas. You don't always need to be connected to the internet to use the app. You can use it offline most of the time. You can also reduce telecommunications costs during travel abroad. This app is very light (around 20Mb), you can download it at the airport or if you can' t use wi-fi there. Please note that if you press share buttons or press phrase request buttons and an advertisement while the app is launched, it goes online and communication fee may be applied. Please be aware that if you would like to use offline. Operation is very simple with user-friendly design. Translated phrases are available to zoom in, voice-over, text copy, and share to SNS. "want to communicate well in local language during their first time travel abroad"
"can speak the language a little but want to check the phrases before speaking"
"want to use audio playback for better communication"
"want to communicate well for traveler from abroad "
"want to use it for free"
"Excuse Me Itarian" has been launched. All apps have been updated. Excuse Me apps on iTunes app Store! Excuse Me apps on Google Play! This End User License Agreement (hereinafter referred to as "this Agreement") is made and entered into by and between the end user of the Pressurepoint application ("the Application") and Pressurepoint Inc. ("the Company"). This Agreement may be revised or renewed in the future, and such revision or renewal shall automatically apply. By using the Application, the user shall be deemed to have consented to this Agreement. The user who is a minor is required to obtain the consent of the user' s legal representatives, such as the user' s parents and persons with parental authority, before the user consents to this Agreement. Any and all rights in respect of all programs, software, services, trademarks, and trade names that compose the Application and of the services, goods, and overall technologies associated therewith which are provided by the Company or its business partner shall be vested in the Company, its business partner, right holders to such programs, or information providers. The user must not act in any way that infringes such rights. The user must not infringe or remodel any of the programs or software that composes this Website. If disputes arise in connection with a user' s violation of this Agreement, such user shall settle the disputes at its own expense and responsibility and indemnify the Company under any circumstances. If the Company or any third party, including the Company' s business partner, suffers any damage due to a user' s violation of the provisions of this Agreement or laws, the said user shall be liable to compensate for such damage and indemnify the Company and any third party, including the Company' s business partner, under any circumstances. If the Company, its business partner or any third party suffers any damage due to a user' s violation with regard to the attribution of rights, such user shall be liable to compensate for all damages incurred by the Company, its business partner, other users, or any third party. The Company may terminate its services without notice to the user. The Company shall not be liable to the user or any third party for any damage incurred by such user or such third party arising indirectly or directly out of such termination regardless of its contents or condition. The Application may include an advertising function to display or alter the contents of advertisements in apps provided by a third party, which is uploaded on the user's smartphone while the user is using the Application online. While the user is using the Application, the Company or the third party provider of such advertisements in apps may use certain information which can be obtained from your smartphone to ensure that the appropriate advertisement is presented within the Application and to calculate the number of views of such advertisement. Data obtained from the user's smartphone includes the IP address, maker, model, viewable time, Location information, and size of an advertisement and the user's response to an advertisement (if any). Obtained data, such as total number, may be disclosed to parties other than the advertisement providers and assignees permitted by the Company in a form that does not personally identify the user. Also, when you click in-app ads, etc., will display third-party web sites, etc.If the user does not wish to receive such advertisements, please stop using the Application. If the Company determines that the user has conducted any of the following acts, the Company may immediately discontinue the use of the services, suspend the payment of compensation, or deregister the user. In addition to the acts stipulated above, any other acts that the Company deems improper. This Agreement shall be effective until terminated. The rights of the user under this Agreement shall be terminated immediately and automatically without notice from the Company if the user fails to comply with any of the terms and conditions of this Agreement. Upon termination, the user must discontinue the use of the Application and destroy all copies of the Application and accompanying data. In no event shall the Company be liable to the user for any damage arising out of this Agreement or the Application or any act in connection therewith. In the case where the use of the Application or the service is free of charge, the Company shall not be liable to the user for any monetary compensation. This Terms and Conditions shall be put into execution on April 1, 2015. Pressurepoint Inc. (hereinafter referred to as the "Company") is aware of the importance of protecting user's privacy. The Company's application shall not request, collect, transfer, or sell personal information, such as name, address, e-mail address, credit card number, or social security number to any third parties. In addition, the Company shall not obtain, use, transfer, or sell to third parties the photographs, contact addresses, or data from other applications that are included within the device. In order to ascertain the state of use of our application and improve services, the Company's application uses information but individuals cannot be identified by such information. The information shall consist solely of the vendor authentication ID (IDFA), IP address, cookies, manufacturer, model, OS version, and time of use of the application. In this application, advertisements within the application are provided by third parties and are uploaded to users' smartphones and displayed while the application is used online. In order for the Company or third-party providers to display appropriate advertisements within the application on the smartphone and calculate the number of times advertisements are viewed, specific information from users' smartphones may be acquired. The data obtained from smartphones includes the vendor authentication ID (IDFA), IP address, cookies, manufacturer, model, OS version, time, and the size of advertisements displayed, as well as responses when advertisements are viewed. The totals of such data may be disclosed to providers of advertisements within the application and parties other than those that the Company has licensed for transfers; however, such information cannot be used to identify individual users. If you have any comments, send them from Mail button, please. That is only way to let us know.Thank you for your feedback. Copyright 2002 Pressurepoint Inc. All Rights Reserved.